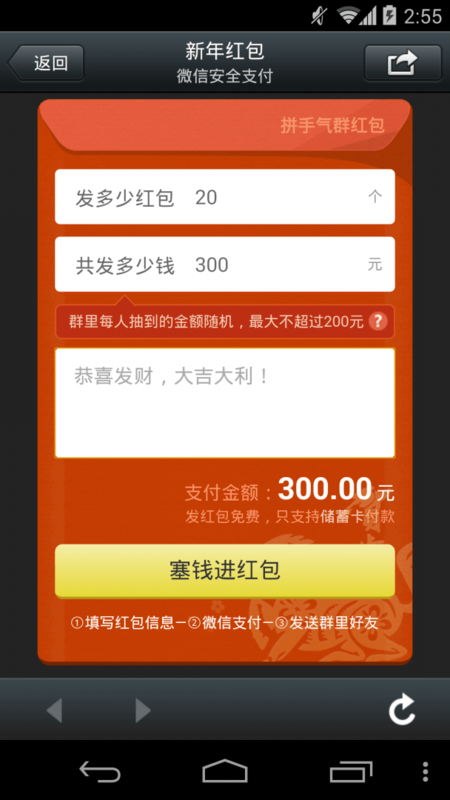 WeChat creates a social game for giving away New Year Lucky Money. WeChat Payment will be the biggest winner. 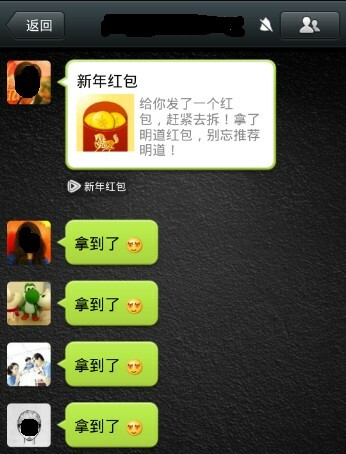 WeChat just launched a feature for users to give lucky money to other users during the Chinese New Year holiday season. Unlike the tradition that Chinese adults give cash, or physical Red Packets, to kids or bosses to employees, the WeChat feature encourages you give lucky money to any other users in chat groups in a new way. It became an immediate hit and possibly has added many new users of WeChat Payment. 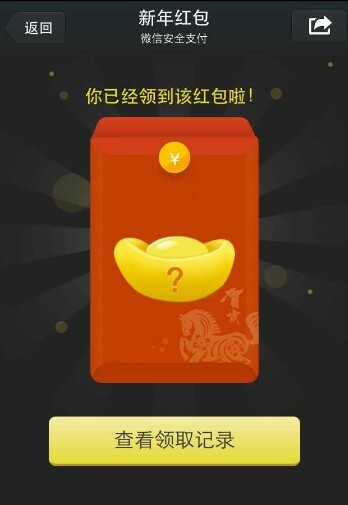 After following New Year Lucky Money, an official WeChat account, you can set up luck money packets you’d like to give away. There are two ways for you to give away money: one is sending certain amounts to certain WeChat contacts; the other is filling in the total amount and the number of packets, and then let WeChat randomly divide it. Two buttons for different ways of sending lucky money packets. The second one is the cause that the feature got much traction quickly, as WeChat group members would rush to click open a red packet, sent out as a group message, to see whether they can get one. For instance, you have decided to give away RMB100 to 20 people. WeChat will help you divide the RMB100 into 20 sets randomly. Then WeChat will generate a message for you to send out to a group. If there are more than 20 members in the group, the first 20 who click open the message will receive money. But the earliest one doesn’t necessarily get the one with the largest amount of money. So that’s all about luck. The interface for filling in the total amount and the number of packets. Click open the Lucky Money message for a red packet. Congratulations! You got a packet. You can also check out all the packets received by clicking on the button below. Previously it was possible to send digital lucky money too, through tools like Alibaba’s payments service Alipay. But you could only send certain amounts of money to certain people. Recently Alipay also improved the lucky money giving feature on its mobile app that now you can ask for lucky money from your contacts. But people must feel happier to receive money than be asked to give. The WeChat feature adds much fun for giving away lucky money. Many WeChat users, just for fun, are sending small amounts of money to people in groups they’d otherwise never give lucky money to. No matter how small the total amount of each packet, the winner will be WeChat Payment. 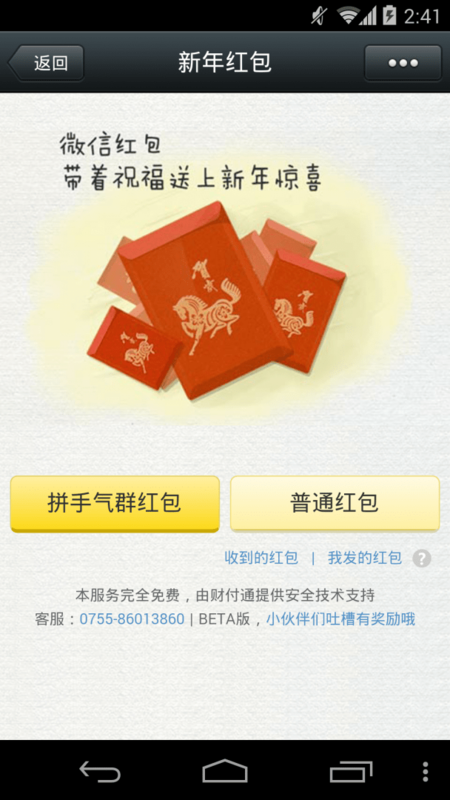 To send out red packets or cash in all received, WeChat users must have WeChat Payment activated. If a user hasn’t signed up to WeChat Payment after having successfully grabbed a red packet in a group, the system will bring him or her to bundle a debit card right away. In such a scenario, staring at the amount of money sitting on the list of ‘red packets you have received’, the user must feel impulsive to do so.